VALIDATED: WHERE ARE YOU FROM AND WHAT'S THE STORY BEHIND YOUR ARTIST NAME? CONFUSE ART: I AM FROM HAMBURG, GERMANY AND MY ARTISTIC NAME GOES WITH ME AS A PERSON. I USE TO BE A CONFUSED PERSON, AND ALSO IT IS MY NAME AS A MC "CONFUSE". VALIDATED: DID YOU EVER VENTURE INTO GRAFFITI? CONFUSE ART: YES, IN '95 A WELL KNOWN HAMBURG GRAFFITI ARTIST CALLED "EASY" GAVE A TWO WEEK GRAFFITI COURSE FOR EVERYBODY, AND SHOWED US THE MOVIE "WILDSTYLE" (1982 FILM). SINCE THAT DAY I LOVED GRAFFITI, MY NAME USE TO BE "SEKTOR" AND SOMETIMES I DO SOME SKETCHES, BUT JUST IN A BLACKBOOK. VALIDATED: GROWING UP, WHAT KIND OF MUSIC WAS PLAYED IN YOUR HOUSEHOLD AND HOW HAS IT FOUND ITS SOUL IN ART THAT YOU CREATE? CONFUSE ART: MY FATHER WAS LISTENING TO DIRE STRAITS AND THE BEATLES, BUT IT AIN'T HAD A REAL INFLUENCE ON ME, EVEN IF I LIKE A FEW TRACKS HE LISTENED TO. VALIDATED: WHERE ARE YOU FROM? HOW DID YOU FIND SUCH A HIP-HOP INFLUENCE? HAVE YOU TRAVELED THE WORLD FOR INSPIRATION? IF SO, WHERE HAVE U GONE? CONFUSE ART: I COME FROM HAMBURG GERMANY, AND HIP HOP WAS ALWAYS THE MUSIC I COULD IDENTIFY TO THE MOST. TO ME IT FEELS NATURAL, IT'S MY LANE. I ALSO USE TO RAP, BUILD BEATS, AND DO GRAFFITI. HIP HOP IS MY TRUTH, IT'S A LOVE FOR LIFE. I DIDN'T TRAVEL A LOT, BESIDES GREEK, AUSTRIA, ITALY AND EGYPT. VALIDATED: DO YOU PLAY SPORTS OR HAVE ANY MUSIC ABILITY? CONFUSE ART: I DON'T DO SPORT'S, I GOT MY MAIN FOCUS ON MY ART. MY MUSIC ABILITY IS BUILDING BEATS, WRITING LYRICS, AND I USE TO FREESTYLE ALL DAY FOR YEARS. VALIDATED: NAME THE HIP-HOP ARTISTS THAT HAVE INFLUENCED YOUR ART MOST AND WHY DO YOU FEEL GRAVITATED TO THEM? CONFUSE ART: I PAINT DIFFERENT ARTISTS FOR DIFFERENT REASONS. I HAVE LEARNED FROM EVERYBODY SOMETHING GOOD. WHEN I PAINT AN ARCHITECT I TRY TO UNDERLINE HIS OR HER PERSON. YOU COULD SAY, I DO TRIBUTES TO THE ARTISTS I GREW UP ON. VALIDATED: DO YOU SHOWCASE ANY OTHER INFLUENCE IN YOUR ART OUTSIDE OF "HIP HOP"? CONFUSE ART: OTHER ART THAN HIP HOP, I WOULD SAY MOVIES LIKE "DIE HARD", "PREDATOR", "RAMBO", ETC. SOME ACTION STUFF, AND A HUGE INFLUENCE FROM MARVEL, EVEN IF IT DOESN'T SHOW UP IN MY STYLE. VALIDATED: WHAT SACRIFICES HAVE YOU MADE OR THINGS THAT YOU HAD TO GO WITHOUT BECAUSE YOU'VE INVESTED IN YOUR ARTISTRY? CONFUSE ART: THERE ARE A LOT OF SACRIFICES TO MAKE, AND YOU GOT TO GROW WITH THEM. IT'S A CONSISTENT LEARNING CURVE, BUT REJECTION WAS A BIG PART, EVEN WHEN KNOW YOUR STUFF IS DOPE. THE MOST IMPORTANT THING I HAVE LEARNED IS TO JUST BELIEVE IN YOURSELF, AND FIND YOUR LANE. MY LANE IS HIP HOP, AND IT ALWAYS WILL BE, AND AIN'T NOBODY GOING TO STOP ME FROM DOING MY THING. CONFUSE ART: MY EARLIEST CONTACT WITH HIP HOP WAS THE FATBOY'S, "TWIST" AND KRIS KROSS, "JUMP". IT WAS A SCHOOL THEATRE, AND SOME OF MY CLASSMATES PREFORMED KRIS KROSS "JUMP". I EVEN GOT A VIDEO OF IT, WHERE YOU SEE ME COPYING THE MOVES THEY MADE. VALIDATED: AND WHAT IS YOUR EARLIEST MEMORY OF YOUR ABILITY TO DRAW? CONFUSE ART: THE EARLIEST MEMORY OF PAINTING IS COPYING THE BOSSES OF MEGAMAN (NINTENDO CONSOLE GAME) ABOUT 1992. VALIDATED: WAS YOUR FAMILY SUPPORTIVE OF YOUR ARTISTIC AMBITIONS? WHEN DID THEY REALIZE THAT YOUR TALENT WAS SO FAR BEYOND AVERAGE? CONFUSE ART: I THINK THEY ALWAYS KNEW, THEY SUPPORTED ME SINCE THE FIRST DAY. YOU CAN'T BE BLESSED WITH BETTER PARENTS. VALIDATED: WHAT ARE YOUR THOUGHTS ON LYRICS REMERGING AS THE FOCUS IN HIP-HOP AGAIN? DO YOU THINK THAT LYRICS WILL EVER BE AS CELEBRATED AS THEY ONCE WERE? CONFUSE ART: I THINK THE LYRICISM IS VERY ESSENTIAL TO HIP HOP. KNOWLEDGE ALWAYS WAS A MAJOR PART OF HIP HOP AND I'M HAPPY IT'S BACK. AND I THINK THE KIDS FROM THE 90'S TO EARLY 2000'S DEFINITELY WELCOME IT WITH OPEN ARMS. YOU CAN'T DENY GREATNESS. SO, HOLA TO ALL HIP HOP ARCHITECTS. VALIDATED: NOT INCLUDING YOU, NAME YOUR TOP 3 MOST CREATIVE ARTISTS YOU'VE SEEN AND WHY. CONFUSE ART: BOBBY CHIU (CANADIAN ART TEACHER AND OWNER OF SCHOOLISM), HE HAD THE BIGGEST INFLUENCE ON MY CRAFT BECAUSE OF HIS PHILOSOPHIES. I SEE HIM AS THE YODA OF DIGITAL ART, HE WAS THE FIRST. ALSO JASON SEILER, THE WORLD'S BEST CARICATURIST. I TOOK HIS PORTRAIT AND CARICATURE ONLINE CLASS ON SCHOOLISM, THE SELF TAUGHT VERSION. AND "TOAST", A SUPER TALENTED GRAFFITI ARTIST. HIS ART IS SUPER DOPE, AND INSPIRED ME SO MUCH IN THE 90'S TILL THIS DAY. IN RETROSPECT I THINK HE IS A BIG PART OF WHY I BE DOING CARICATURES. VALIDATED: WHAT PIECES THAT YOU HAVE RELEASED ARE YOU MOST PROUD OF? WHY? CONFUSE ART: THE MASTER ACE AND LESCHEA PORTRAIT, HE RETWEETED THE VIDEO I MADE OF HIM ON TWITTER. YOU CAN SEE THE MASTER ACE VIDEO ON MY YOUTUBE CHANNEL. TO ME HE'S THE GRANDMASTER OF COUNTLESS INFLUENCED MC'S. EVEN EMINEM, AND THAT SPEAKS FOR ITSELF. ALSO BECAUSE HE WAS THE FIRST ARCHITECT WHO REACHED OUT TO ME, AND GAVE ME A COMMISSION TO PAINT HIS SUPER LOVELY WIFE LESCHEA, FOR THEIR 10 ANNIVERSARY. I SEE THE PORTRAIT EVERY SINGLE SUNDAY ON THE “LESCHEA SHOW” IN THE ORANGE BASEMENT, (I'M A HUGE FAN OF THE SHOW) SO I OWE HIM EVERYTHING, BIGGEST MILESTONE EVER! AFTER THAT, A LOT OF PEOPLE REACHED OUT TO ME, YOU CAN SAY, HE VERIFIED ME. VALIDATED: WHAT CAN FANS EXPECT FROM YOUR LATEST/UPCOMING PROJECTS? CONFUSE ART: I AM HAPPY TO SAY THAT I RECENTLY PARTNERED UP WITH MIC HANDZ AND SNKRHEAD. WE ARE PLANNING TO DO A LOT OF DOPE STUFF TOGETHER IN 2019. BE CURIOUS AND ENJOY THE RIDE. ALSO, YOU WILL GET THE OPPORTUNITY TO GET SOME ART ORIGINALS FROM ME IN 2019. VALIDATED: WHAT'S THE BIGGEST PLATFORMS THAT YOU'VE SEEN YOUR WORK ON? CONFUSE ART: INSTAGRAM HAD THE BIGGEST IMPACT, SECOND I WOULD SAY TWITTER, THEN FACEBOOK. VALIDATED: DO YOU HAVE A UNIQUE PROCESS OR APPROACH TO YOU WORKS? CONFUSE ART: I ALWAYS TRY TO DO NEW CHALLENGING STUFF AND LEVEL UP. THERE'S STILL A LOT TO LEARN... PUSH YOURSELF AS FAR AS POSSIBLE, AND DON'T HAVE ANY FEAR TO TRY OUT NEW THINGS, BE OPEN TO NEW STYLES, LEARN FROM GREAT ARTISTS BUT DON'T COPY THEM. IT IS A BIG SIN TO BITE ARTISTS, JUST BE INFLUENCED. VALIDATED: THE CARICATURES, WHAT MADE YOU VENTURE INTO CREATING THESE HILARIOUS PIECES? CONFUSE ART: I ALWAYS WAS FASCINATED WITH THE HUMAN FACE, YOU CAN LEARN A LOT STUDYING THE HUMAN FACE. WHEN I DID GRAFFITI, I ALWAYS DID CHARACTERS. I DON'T KNOW, IT ALWAYS WAS MY THING BUT TOAST, MODE2, CANTWO, TASEK AND A LOT OF OTHER GREAT GRAFFITI ARTISTS HAD A BIG INFLUENCE ON ME WITH THEIR ART. IF I DO A CARICATURE OF A FAMOUS RAPPER, I AIN'T MAKING FUN OF HIM OR HER. I JUST TRY TO PUSH THE CHARACTER AS FAR AS POSSIBLE BUT ALSO STAY TRUE TO THE ORIGINAL AS WELL. VALIDATED: HOW DIFFICULT IS IT CREATING YOUR OWN LANE WHILE TRYING TO STAY TRUE TO YOU AND YOUR BRAND OF HIP-HIP ART? CONFUSE ART: IT DEFINITELY IS PRETTY HARD BECAUSE IN THE BEGINNING NOBODY IS SEEING THE BIGGER PICTURE. YOU GOT TO BE A LEADER. IT'S NEW TO THE PEOPLE AND IT NEEDS TIME TO BRAND YOUR LANE. YOU GOT TO EXPLAIN YOUR ART, WHAT IS IT, WHAT YOU DOING, AND WHY? YOU GOT TO MAKE IT UNDERSTANDABLE. VALIDATED: ARE THERE ANY PARALLELS BETWEEN THE JOURNEY ESTABLISHING YOUR IDENTITY AS A VISUAL ARTIST AND BECOMING THE MAN YOU'VE BECOME? CONFUSE ART: THE JOURNEY MADE ME THE MAN I AM TODAY. I HAD TO LEARN A LOT OF STUFF, AND I HAD TO GO THROUGH A LOT OF FAILURES. THERE IS A LOT MORE BEHIND IT THAN DOING GOOD ART, (ICEBERG PRINCIPLE) BUT I LOVE THE CHALLENGE AND THE JOURNEY. YOU CAN WIN IF YOU PUSH YOURSELF OUT OF YOUR COMFORT ZONE AND LEARN FROM YOUR MISTAKES. VALIDATED: WHAT WERE A FEW OF THE HIGHLIGHTS/REWARDS OF WHERE YOUR ARTWORK HAS TAKEN YOU? CONFUSE ART: BIGGEST HIGHLIGHT WAS THE ANNIVERSARY PORTRAIT FOR ACE AND LESCHEA AND WORKING TOGETHER WITH NAUGHTY BY NATURE. I MADE A PORTRAIT FOR THEM, AND SEEING MY ART ON THEIR STAGE WAS HUGE TO ME. ALSO B-REAL REPOSTED MY INSTAGRAM VIDEO OF HIS PORTRAIT ON HIS INSTAGRAM. A FEW SUPER DOPE MC'S LIKE PHAROAHE MONCH, REDMAN AND ICE T, RESPONDED ON MY PICTURES OF THEM. SO I FEEL BLESSED ALL DAY, I'M VERY GRATEFUL FOR IT. VALIDATED: WHAT ARE SOME OF YOUR MOST NOTABLE COMMERCIALLY SUCCESSFUL OR RECOGNIZABLE PIECES OF ART? CONFUSE ART: MOST PEOPLE LOVE THE RED AND METHODMAN THE NOTORIOUS BIG, AND CHAPELLE CARICATURES. ALSO THE PORTRAITS OF MASTER ACE AND LESCHEA, NAUGHTY BY NATURE AND BUSTA RHYMES, MF DOOM AND RAKIM ARE LIKED A LOT. I'M SUPER GRATEFUL TO GET SOME LOVE FOR MY ART... PRICELESS! VALIDATED: DO YOU ONLY DO HIP-HOP INSPIRED URBAN CULTURE ART OR DO YOU EXPLORE OTHER SPACES ARTISTICALLY LIKE FINE ART, PAINTING OR COMIC BOOK ART? CONFUSE ART: I DEFINITELY WILL MAKE SOME ACRYLIC PORTRAITS AND CARICATURES IN 2019, AND ORIGINALS WITH PENCIL AND MARKERS AND PLAY AROUND WITH MY STYLE, ALSO COMIC STYLE. VALIDATED: HOW DO YOU FEEL THE HIP-HOP CULTURE HAS EMBRACED YOUR ART AFTER GIVING THEM SUCH SOON TO BE ICONIC IMAGERY LIKE ICE CUBE, WU TANG CLAN, ICE T, AND NAUGHTY BY NATURE? CONFUSE ART: OH MAN, I FEEL SUPER HONORED AN ACCEPTED IN THE HIP HOP UNIVERSE. I ALWAYS WAS TREATED WITH RESPECT, BUT BESIDE HIP HOP, PEOPLES LOOKED AT ME LIKE TRASH. SO A BIG MISSION FOR ME IS TO SHOW THE DOUBTERS OF HIP HOP, THAT THEY ARE WRONG. HIP HOP IS A SERIOUS ART, AND THE MOST POWERFUL AS WELL. VALIDATED: WHAT'S YOUR MOST MEMORABLE ARTIST, ACTOR OR ATHLETE RESPONSE TO YOUR ART AND OR MUSIC? 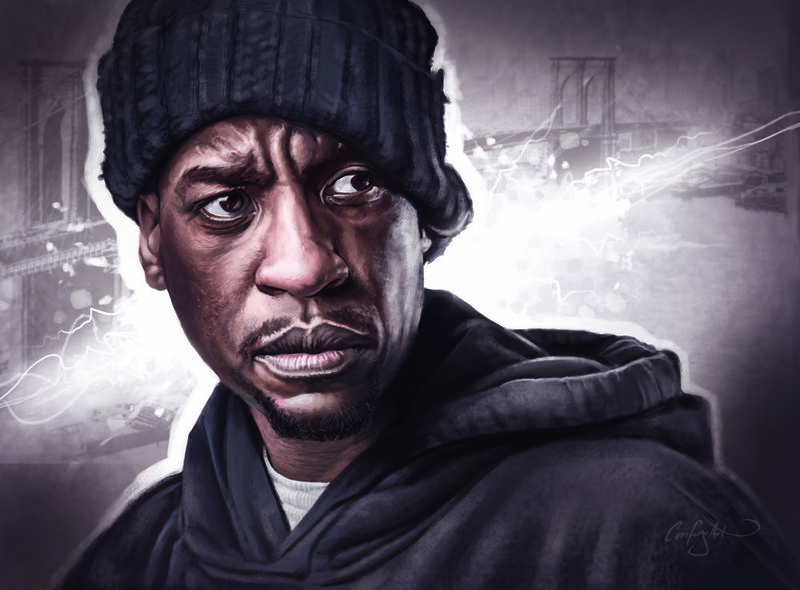 CONFUSE ART: MASTA ACE, LESCHEA,NAUGHTY BY NATURE, B REAL, REDMAN AND ICE T.
VALIDATED: HAVE YOU EVER HAD ANY FORMAL ART EDUCATION OR ARE YOU SELF TAUGHT? CONFUSE ART: I TRIED TO GET INTO ART COLLEGE, BUT THEY DIDN'T SEE ART IN WHAT I DO. I TRIED THREE TIMES, BUT THEN I FOUND BOBBY CHIU ON YOUTUBE AROUND 2007. I GATHERED A LITTLE BIT OF MONEY AND TOOK A FEW SELF TAUGHT CLASSES, ON SCHOOLISM, BEST ART SCHOOL WORLDWIDE, HANDS DOWN BUT FOR THE MOST PART, I'M SELF TAUGHT. CONFUSE ART: IN 2019 I WILL BE WORKING WITH MY NEW SUPER INSPIRING ARTIST PARTNERS, MIC HANDZ AND SNKRHEAD. I CAN'T WAIT TO DO SOME GREAT ART TOGETHER WITH THEM. BESIDES THAT, I'LL BE DOING ORIGINAL ART, YOU WILL SEE. VALIDATED: IF SOMEONE WAS TO CONSIDER YOU AN INNOVATOR AND A PIONEERING CONTRIBUTOR TO THE WORK OF HIP-HOP AND URBAN ART, WHAT WOULD BE YOUR THOUGHT? CONFUSE ART: IF THAT WOULD HAPPEN SOMEDAY "MISSION ACCOMPLISHED" I WOULD SAY. THAT WOULD BE A ULTRA HONOR TO ME, BECAUSE I LIKE TO BE A PART OF THE CULTURE. IT IS A MAIN GOAL IN MY LIFE TO REPRESENT THE CULTURE. I ALWAYS DID IT FOR HIP HOP.... HIP HOP, ONE LOVE. VALIDATED: WHERE CAN THE READER SUPPORT YOU AND YOUR ARTWORK ONLINE AND SOCIAL MEDIA? CONFUSE ART: IF YOU'D LIKE TO SUPPORT ME, YOU CAN REACH OUT TO ME ON MY WEBSITE "WWW.CONFUSEART.DE ", ALSO ON INSTAGRAM, TWITTER AND, FACEBOOK. I'D LIKE TO THANK VALIDATE MAGAZINE AND MIC HANDZ FOR GIVING ME THE OPPORTUNITY TO SPEAK ABOUT MY ART. IT IS MUCH APPRECIATED. THANK YOU VERY MUCH FOR THE ARTICLE.